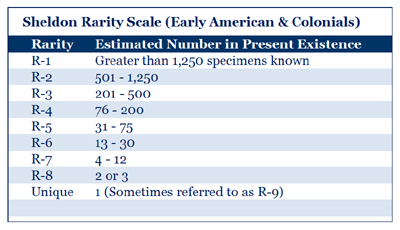 There exist multiple scales for measuring relative rarities of various numismatic specimens. At glance they may appear cumbersome, redundant, and somewhat complicated. However, the scales weren’t invented to confuse collectors. Rather they evolved and were invented over time, and were developed by various researchers within their own associative areas of numismatic expertise. 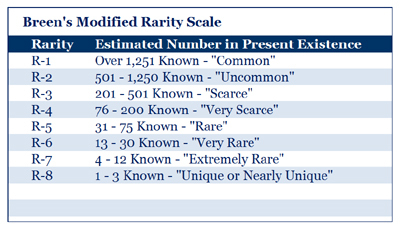 William Sheldon designed a rarity scale for U.S. Large Cents. 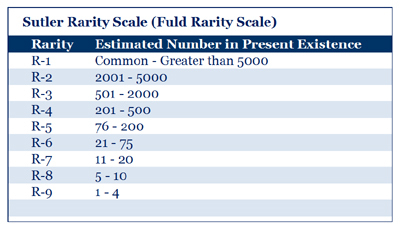 Since created in the 1950s, Sheldon’s scale has been adapted to also describe the rarity of other early coinage varieties. 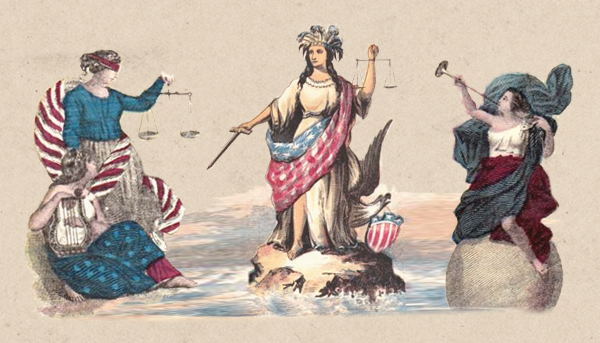 Russell Rulau, author of the United States Tokens 1700-1900 utilizes a scale very similar to the Fuld scales introduced below. In Rulau’s scale, there are 9 degrees of rarity. Walter Breen developed a hybrid scale, based on one developed by Sheldon. The scale is infrequently seen. 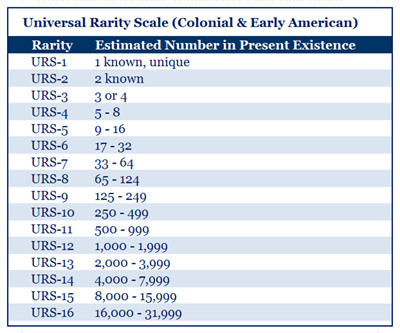 To date I have only seen Breen’s scale used in his own work: Walter Breen’s Encyclopedia of U.S. and Colonial Coins. 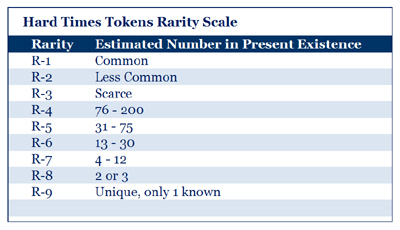 Tony Chibbaro in his ongoing documentation and research into South Carolina tokens, developed a rarity scale specific to that state. 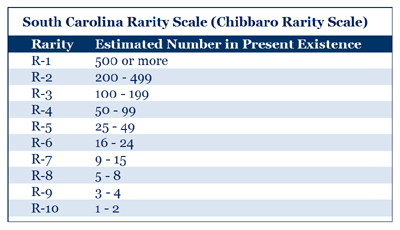 Though Chibbaro uses the same “R” notation, his scale differs significantly in the corresponding numbers for each rarity number. 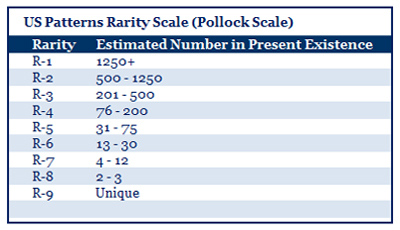 Donald Edkins in his research into metallic scrip, developed a rarity scale for coal tokens. 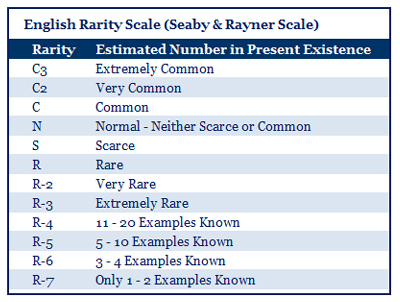 Though he developed the same “R” notation, Edkins’ scale differs greatly in the corresponding numbers for each rarity number. 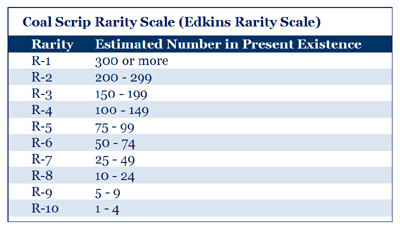 Edkins’ Rarity Scale utilizes 10 degrees of rarity. 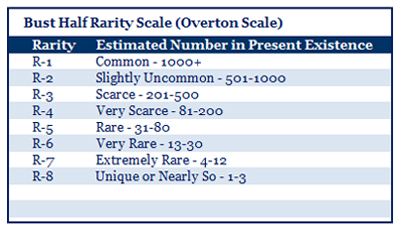 The Overton Scale is used to describe the rarities of United States Bust Half Dollars. As with other scales, it varies slightly. 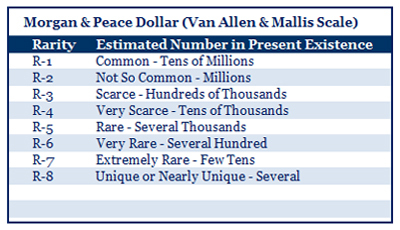 In their 4th edition, Leroy Van Allen and A. George Mallis, authors of the Comprehensive Catalog and Encyclopedia of Morgan and Peace Dollars, present a rarity scale pursuant to Morgan and Peace Dollars. 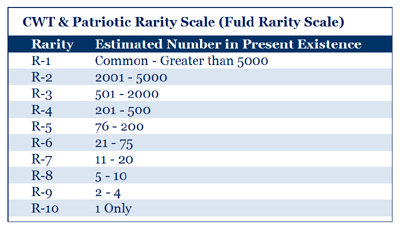 Andrew W. Pollock in his 1994 book United States Patterns and Related Issues established a rarity scale to describe the scarcity of United States Gold Pattern coins. As with other scales, it varies slightly.